If you want to enjoy a great view of Belfast from a location 120 metres above sea level, visit Belfast Castle. The castle can be found in the Cavehill Country Park. Its predecessor was built in the 12th century in the city centre, but that was burned down in 1708. Instead of building a new on the same spot, the built a new one, but on a different spot. The building as we see it today was built in the 19th century. The Castle was for a long time closed for tourists, but since 1988 it can be visited by everyone. Inside you can find an antiques shop, a restaurant and a visitors centre. The Castle is often used for receptions, weddings and other special events. 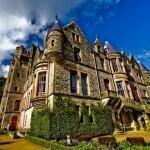 Belfast Castle can be reached using buses 1A, 1B, 1C, 1D, 1E, 1F, 1G and 2A. Ask your driver for information about where to leave the bus. If you go to far, you might end up visiting the Zoo instead.